A healthy preparation, ideal for breakfast, and easy to make. In a pressure pan, take some ghee, and fry jeera seeds, red chillies, & curry leaves. Add some hing powder and saute for a while. Now add the vegetables, stir fry for a while. Now add the rice, dal and milk. Add 2 cups of water, and then add pepper powder, coriander powder, salt, and mix well. Close the pressure pan and cook for around 15-20 minutes. 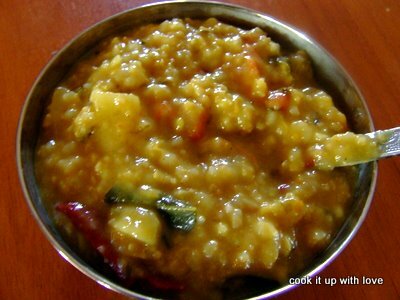 Pongal is ready; serve hot after topping it with some fried cashews.